Baby Peep, originally uploaded by Temeculamom. Just a little treat for you. Sophia’s kindergarten class got to hatch two little ducklings. This is Peep at 4 days old. The kids (and teacher, and parents) have so enjoyed watching these little guys grow. They will be going home to live with one of the little boys and his family. ~ by bekaboo on March 31, 2007. How gorgeous!!!!! I want one!! 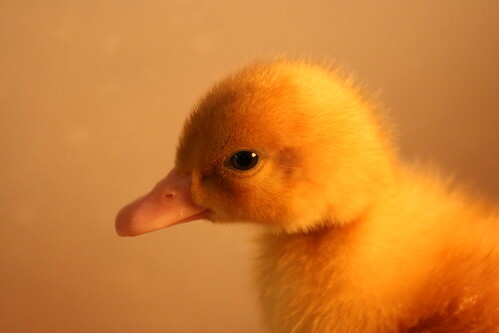 I remember when my daughter brought home a duckling from school. We made a pen from 3 ring binders to try to keep it in one place but it jumped over the top and ran around the house. Boy those things can turn on the speed.